With foams, you need ARFF to extinguish nonpolar, Class B fires and you need the more expensive AR-AFFF to extinguish polar, Class B fires, like the ethanol-blended fuels cars are using across the country. With F-500 Encapsulator Agent, it doesn’t matter what type Class B fire. The same F-500 EA works on Class A, Class B polar, Class B nonpolar, Class D and is even recommended by ConEdison for energized transformer fires (streaming from 125 feet). Multiple companies have also recommended F-500 EA for lithium-ion battery fires, as the only agent that quickly extinguishes these fires, without reignition. Aside from being able to extinguish almost everything, you get a bonus with F-500 EA. Since it encapsulates hydrocarbons, F-500 EA can render fuel spills nonflammable. There’s no need for sustaining a blanket of foam. There’s no need for absorbents and costly spill removal. Yes. F-500 EA will even encapsulate ethanol and ethanol-blended fuels. 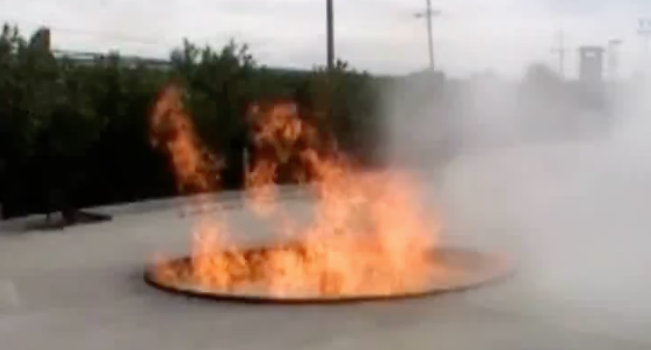 Watch this video as the firefighter applies a torch to encapsulated E85 ethanol-blended fuel. If we can help you with any questions about F-500 Encapsulator Agent, Pinnacle foam or HCT’s portable delivery equipment, please don’t hesitate to contact us. Put the Engineered Advantage of F-500 Encapsulator Agent to work for you.